Air New Zealand is giving their customers a taste of the future. 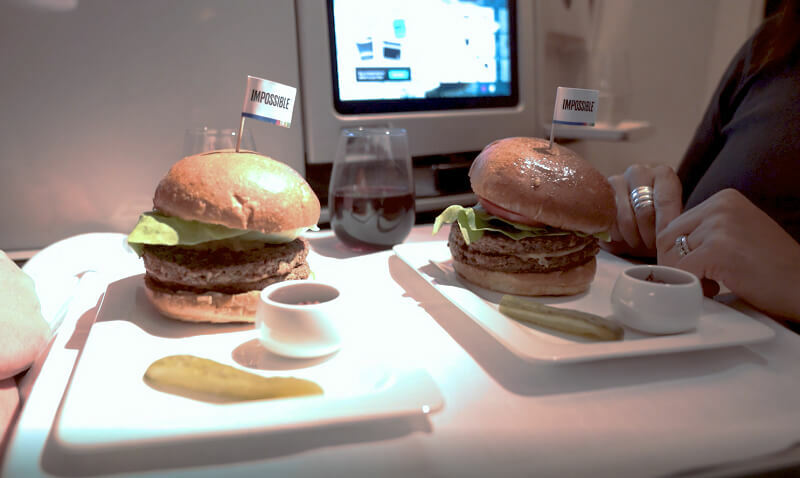 A new in-flight collaboration with Silicon Valley food tech start-up, Impossible Foods. The days of boring, vegan-unfriendly in-flight meals are over! If you're like me, you still remember what your last burger tasted like. It was pretty damn tasty right? The Impossible Burger’s magic ingredient is an iron-containing molecule called heme which comes from the roots of soy plants; exactly the same as the heme found in animal meat. Air New Zealand are officially the first airline service in the world to serve this award-winning, plant-based burger. If you're lucky enough to fly Business Premier Class, you'll notice this welcome addition to their menu on flights from Los Angeles to Auckland. To create this incredible new meal, Impossible Foods has had their dedicated team of top scientists, farmers and chefs, spend the last six years studying what makes a good beef burger patty. They identified methods and ingredients to naturally recreate everything -- the sights, sounds, aromas, textures and flavors. So how did they go? Well, the end result is an impossibly delicious game changer of a burger. Also, because they use 0% cows, the Impossible Burger impacts only a fraction of the Earth’s natural resources. creates 87% less greenhouse gas emissions. Oh and it’s 100% free of hormones, antibiotics, and artificial ingredients — cruelty-free and extremely beneficial to our environment! Flying with Air New Zealand anytime soon? I wish I was! Got any thoughts on this? Let's hear it!